MONROE, Mi., April 21, 2010 – DynoMax® Performance Exhaust has announced a new stainless steel power-enhancing, cat-back exhaust system for 2009-10 Chevrolet Silverado/Sierra 1500 4.8L/5.3L Crew Cab Short Bed/Extended Cab Standard Bed pickups. 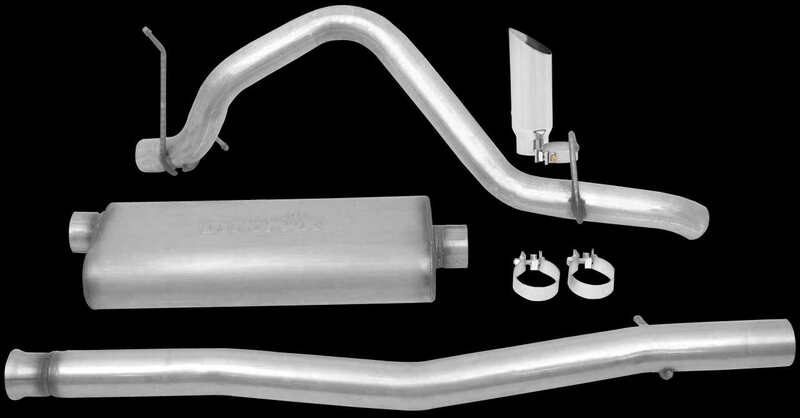 Providing high performance, unique sound and less restriction, the new DynoMax® exhaust system (P/N 39495) for Chevy Silverado/GMC Sierra truck models provides an increase of 23 horsepower and 30-ft. lbs. of torque. The new cat-back system is available at performance retailers nationwide. DynoMax, an innovator in performance cat-back exhaust systems and mufflers, is manufactured and marketed by Tenneco Inc. (NYSE: TEN). DynoMax is one of North America’s leading suppliers of dyno-proven exhaust technologies for muscle cars, diesel and gas trucks and sport utility vehicles, and sport compact/European cars. The system centers around an innovative Ultra Flo™ Welded muffler, a straight-through, unrestricted design that is dyno-proven to support up to 2,000 SCFM and 2,000 horsepower. These mufflers are 100-percent welded for exceptional life and durability, and also include exclusive Continuous Roving Fiberglass (CRF) technology to absorb unwanted interior resonance and provide a rich, deep performance tone. The system features 3-in. mandrel-bent, 409-grade stainless steel piping, providing extended protection against corrosion, and a show-styled double-walled, logo-embossed 4-in. tip. Each DynoMax system includes all OE-quality hangers and accessories for a fast, easy installation. The new stainless system is covered by a limited lifetime warranty and exclusive 90-day Performance and Sound Guarantee, an offer that lets enthusiasts try the system for 90 days. Consumers can return the product within 90 days for a full refund of its purchase price. Additional restrictions apply and can be found at www.DynoMax.com. I really like the sound of this. A nice performance boost and the Dynomax always has great sound. I saw these and other Dyno products at this site the other day. Might be worth a look. Thanks for all the info on these.